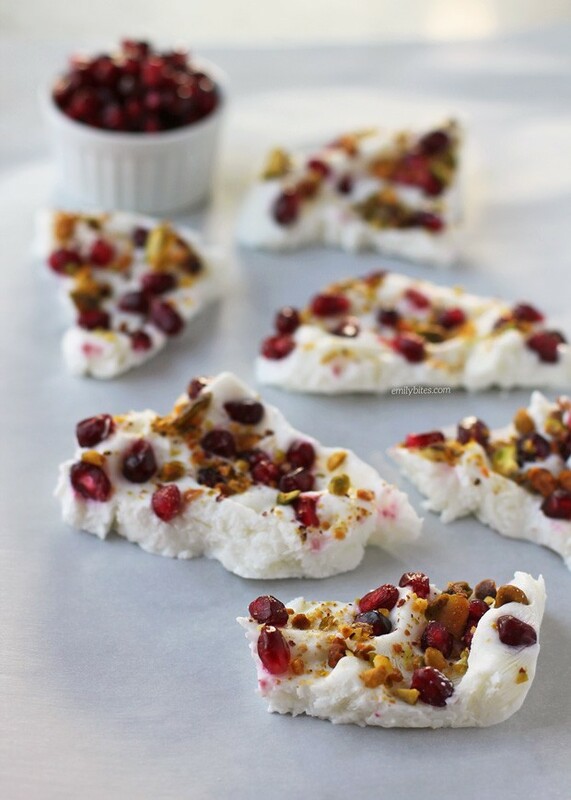 This Pomegranate and Pistachio Frozen Yogurt Bark is an easy, festive, healthy 3 ingredient snack that your family and friends will love. It takes just minutes to prep and each serving is just 91 calories or 2 Weight Watchers SmartPoints! You can make this bark with all different yogurt flavors, fruits, nuts, chocolate chips or other toppings, but I wanted to go with a red and green theme for the holidays. I love the sweet and lightly salty mix of pomegranates, vanilla yogurt and roasted pistachio nuts! Not only does this bark make a great snack but it’s also perfect for dessert or even breakfast (it’s yogurt!). This frozen yogurt bark would also be a fun, healthy and tasty project to make with kids. You could let them pick their own toppings and I’m sure they’d have a blast. The only hard part is waiting until it’s done freezing! Just make sure to serve the bark right out of the freezer because if it sits out too long the yogurt will start to melt back to room temperature. Looking for more delicious lightened up recipes using Greek yogurt? Try my Strawberry Banana Frozen Yogurt Bites, Key Lime Cheesecake Cups, Silver Dollar Banana Pancakes, Blueberry Baked Oatmeal Singles, Spinach and Artichoke Dip and more in the yogurt section of my recipe index! Line a 7×11 or 9×9 baking dish with parchment paper (I creased my paper along the bottom edges of the dish to help it stay put). Empty the yogurt containers into the dish and use a rubber spatula to spread it evenly across the bottom of the dish. Sprinkle the pomegranate arils across the surface of the yogurt and then press them in a bit so that they’re not just resting loosely on top. Put the shelled pistachios into a Ziploc bag and crush them up using a meat mallet or other heavy object. 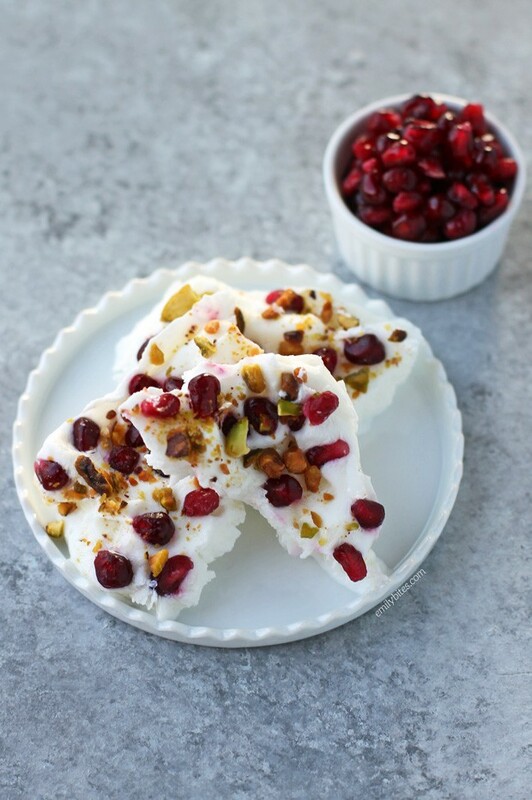 Sprinkle the crushed pistachio nuts over top of the yogurt and pomegranate seeds. Place the entire baking dish into the freezer and freeze for at least 5-6 hours (check to see if your yogurt is frozen solid before removing from the freezer). Lift the parchment paper with the slab of frozen yogurt out of the baking dish and place on a flat surface. Break the slab of yogurt into pieces (“bark”) and serve immediately. Leftovers should be wrapped (I layered mine with parchment paper in a Tupperware) and returned to the freezer. My finished product weighed about 18 oz, so each serving was 4.5 ounces. This was the perfect mix of salty/sweet for a snack this weekend! I loved everything about it! Thanks for the fun idea!! I made this last weekend and really enjoyed it. The leftovers are great too! I used Chobani Simply 100 vanilla yogurt and it worked well. Thanks.